Motivational Interviewing (MI) is a well-researched form of therapy to bring about change in resistant clients. MI is a directive and client-centred counselling method, which has been refined over the last 30+ years to support clients in exploring and resolving ambivalence. It does so by evoking internal motivation for behaviour change. MI is more than just a set of techniques, it is an interpersonal approach that honours each individual client’s autonomy whilst staying firmly placed as a productive goal-oriented approach. Over its three-decade history of development and evolution, MI has moved from being an approach to enhance alcoholic’s motivation to change their behaviour, to a well-established approach employed across addictions, and used by many health professionals in many facets of client/patient-contact from dentists to doctors and beyond. The Psychotherapy Society invites you to an evening of community and learning about MI at the OpenMind learning space on Lyndhurst Terrace in Central. You are invited from 7:00 pm for drinks and canapes with the training event starting at 7:30 pm. We hope you will join us for an exciting, and even hands-on, learning opportunity about an effective way to support others in making choices in their lives by using MI. This learning opportunity will be led by Scarlett Mattoli. Scarlett has studied and worked in the field of psychology for over 25 years and has worked with MI as one of her therapeutic approaches for the past 10 years. 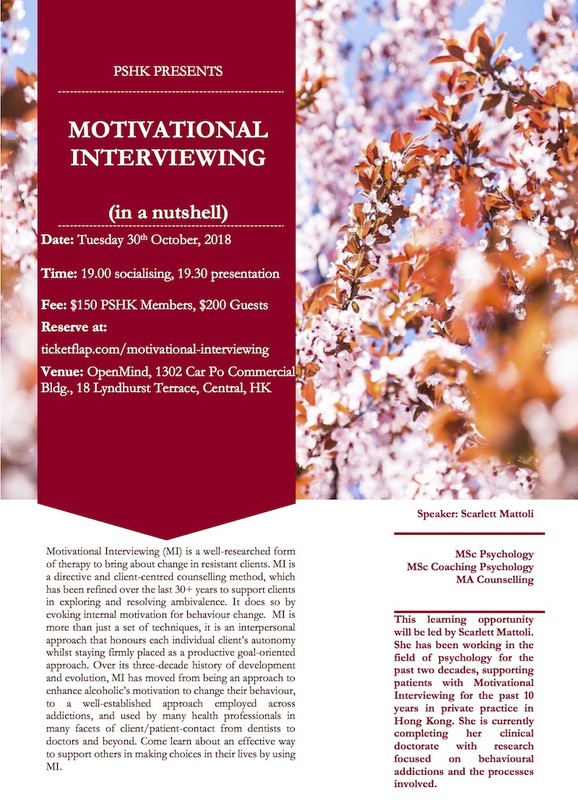 With an MSc in Psychology (Cognitive Neuropsychology), an MSc in Coaching Psychology, and an MA in Counselling, Scarlett is well placed to share her experience with Motivational Interviewing as a modality across a number of relevant populations. Scarlett works in private practice in Hong Kong and is currently completing her clinical doctorate with research focused on behavioural addictions and the processes involved.